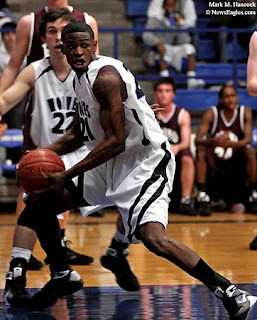 Plano West's Jimmie Jones (No. 3, left) shoots over the top of Plano's Zach Robles (No. 5, right) while Ryan McDuff (No. 13, left) watches during a high school basketball game at Plano West Senior High School in Plano on Tuesday, Jan. 6, 2009. Plano's Rex Burkhead (No. 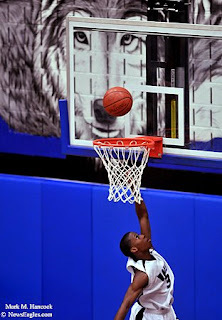 20, right) escapes Plano West's defense during a high school basketball game at Plano West Senior High School. Plano West's Bakari Turner (No. 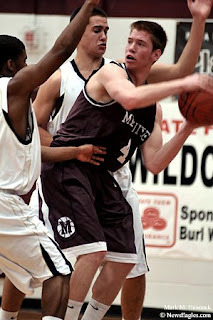 21, center) captures a rebound as Geoffrey Bates (No. 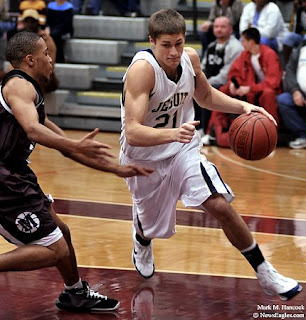 22, left) posts during a high school basketball game in Plano. Plano's Tommy Davies (No. 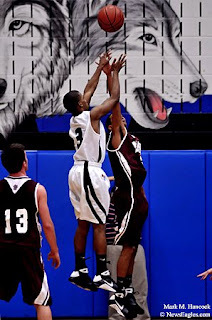 32, right) blocks the shot of Plano West's Jackson Jeffcoat (No. 32, left) as David Thompson (No. 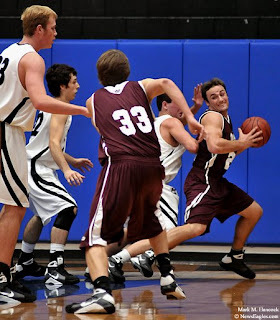 33, center) defends during a high school basketball game. Plano's Clayton Parlin (No. 10, bottom) drives around the defense of Plano West's Jimmie Jones (No. 3, top) during a basketball game. Plano West's Jimmie Jones (No. 3) lays a ball into the hoop during a high school basketball game against Plano Senior High School at Plano West Senior High School in Plano. Plano West won the game 79-60. West eventually became district champions and are still in the hunt for the state championship. Astrophysicist Neil deGrasse Tyson greets about 2,000 fans before presenting "The Cosmic Perspective" as part of the University of Texas at Arlington Maverick Speakers Series at UTA in Arlington on Tuesday, Feb. 17, 2009. 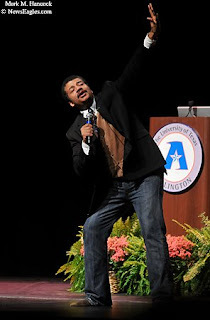 Astrophysicist Neil deGrasse Tyson drops two differently-weighted items to demonstrate Newton's law of universal gravitation at UTA in Arlington. 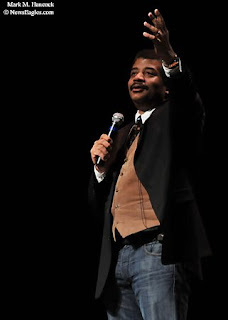 Tyson said Isaac Newton was the smartest human in the planet's history. Astrophysicist Neil deGrasse Tyson presents "The Cosmic Perspective" as part of the University of Texas at Arlington Maverick Speakers Series at UTA in Arlington. Tyson's new book "The Pluto Files: The Rise and Fall of America's Favorite Planet" addresses the debate surrounding his 2006 decision to exhibit Pluto as a Dwarf Planet in the Kuiper Belt. 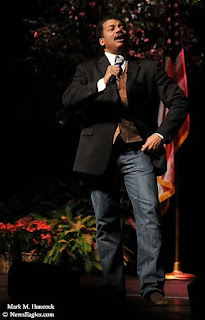 Please see Neil deGrasse Tyson's Web site to learn more about the man and science. 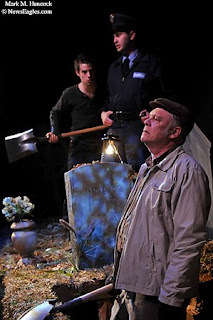 Mick Dowd (John S. Davies, bottom) digs in his late wife's grave as Mairtin Hanlon (Drew Wall, left) and Thomas Hanlon (Ian Sinclair, right) question the gravedigger during a rehearsal of "A Skull In Connemara" in the Studio Theatre at the Addison Theatre Centre on Friday, Jan. 2, 2009. 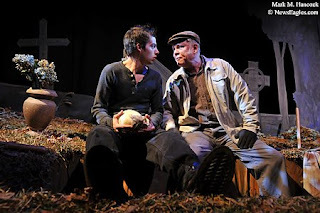 Mick Dowd (John S. Davies, right) talks with Mairtin Hanlon (Drew Wall, left) in the graveyard during a rehearsal of "A Skull In Connemara" in the Studio Theatre. Second Thought Theatre presented the play by Martin McDonagh. 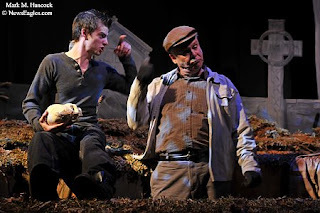 Mick Dowd (John S. Davies, right) talks with Mairtin Hanlon (Drew Wall, left) in the graveyard during a rehearsal of "A Skull In Connemara" in the Studio Theatre at the Addison Theatre Centre in Addison. 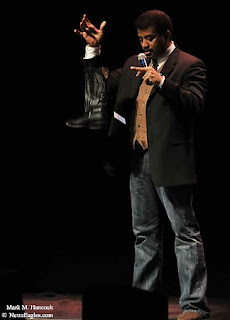 Please read, "Strong acting, dark laughs in 'A Skull in Connemara'" by Lawson Taitte / The Dallas Morning News. Mesquite's Cory Remekun (No. 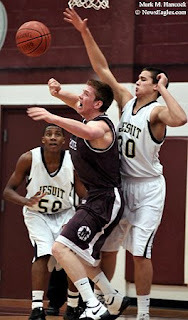 32, center) jumps to the hoop as Jesuit's Josh Bauer (No. 30, left) and Chris Udofia (No. 50, right) defend during the championship game of the State Farm Insurance Plano Wildcat Holiday Classic at Plano Senior High School in Plano on Wednesday, Dec. 31, 2008. Jesuit's Mike Bedford (No. 21, right) tries to find an opening around Mesquite's Jay Payne (No. 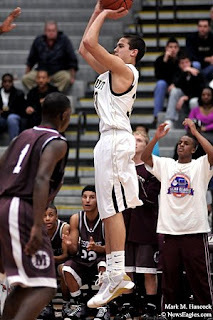 3, left) during the championship game. Mesquite's Chase Hallam (No. 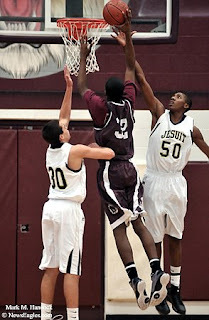 4, center) loses the ball as Jesuit's Chris Udofia (No. 50, left) and Josh Bauer (No. 30, right) defend at Plano Senior High School. Jesuit's Josh Bauer (No. 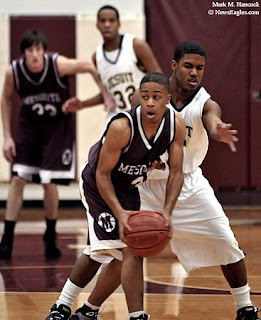 30, right) makes a jump shot as Mesquite's Vertrail Vaughns (No. 1, left) watches during the championship game. Mesquite's Jay Payne (No. 3, left) looks to pass as Jesuit's E.J. McWoods (No. 51, right) defends during the State Farm Insurance Plano Wildcat Holiday Classic tournament. Mesquite's Chase Hallam (No. 4, right) looks to pass as he's surrounded by Jesuit's E.J. McWoods (No. 51, left) and Josh Bauer (No. 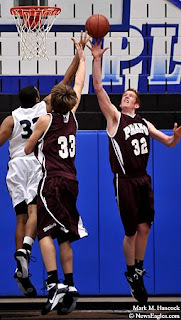 30, center) during the championship game of the tournament at Plano Senior High School in Plano. Jesuit won the game and tournament championship 78-67. 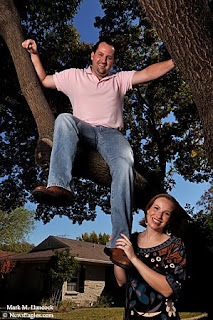 Greg and Emily Allbright pose for a portrait at their home in Dallas on Saturday, Nov. 1, 2008. The couple initially met after work colleagues enrolled Emily on match.com. 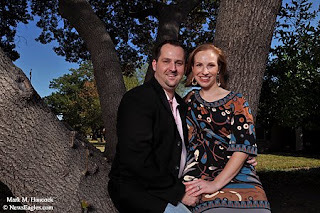 Greg and Emily Allbright pose for a portrait at their home in Dallas. Neither was looking for a serious relationship when they met. 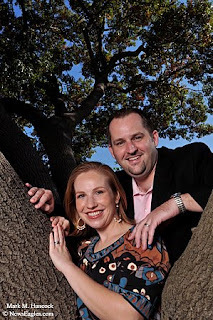 Greg and Emily Allbright pose for a portrait at their home in Dallas. The couple married on May 24, 2008 at St. Thomas Aquinas Catholic Church. 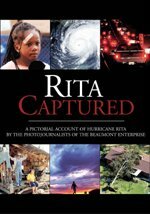 Please read, "True Romance: Couple met while mixing business and pleasure" by Kathleen Green.